Today we're kicking off our A Very Toddler Summer Series hosted by me (Kristina at Toddler Approved) and Jenae at I Can Teach My Child. We're sharing a super simple art activity idea for toddlers!! This project is process focused and perfect to do OUTSIDE! 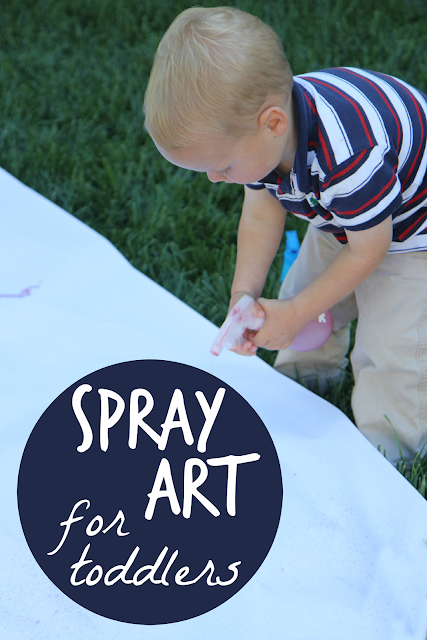 This spray art activity for toddlers only requires a few things and is totally addicting!! It is also messy so be prepared! Our A Very Toddler Summer series is a 10 day series full of simple activities for toddlers! On Mondays and Wednesdays I'll share activity ideas targeted for 2-3 year olds and on Tuesdays and Thursdays Jenae will share activity ideas more for 1-2 year olds. On Fridays we'll share several other favorite summer activity ideas for toddlers that we've found around the web! My son is 2.5 and is currently obsessed with spray bottles. We love to roam the yard with our spray bottle full of water and just spray things and paint the fence with water. A few days ago we decided to change our activity a bit and add some liquid water colors to our spray bottles full of water. You need to make sure to add enough color so that the paint sprays dark or else it doesn't really show up on the white paper. Once your spray bottles are full of liquid water colors (watered down with water), roll out or lay out some paper and you're ready to create!! This spray art activity is solely process centered and not about creating a finished product that looks in any way pretty or a specific way. My toddler just sprayed and sprayed and created rivers of colorful water and sprayed bugs that flew onto the paper and was IN HEAVEN for the 15 minutes this activity lasted. If we'd had more than two colors he probably would've sprayed even longer. He did attempt to spray himself once, but didn't love what happened, so didn't try it again. Later this week we plan to try this activity again using some baking soda, spray bottles, and vinegar and do some Squirt Gun Science (using spray bottles) that was discovered over at No Time for Flashcards. We may also try and make some Spray Art shape projects like we did with our Water Gun painting. 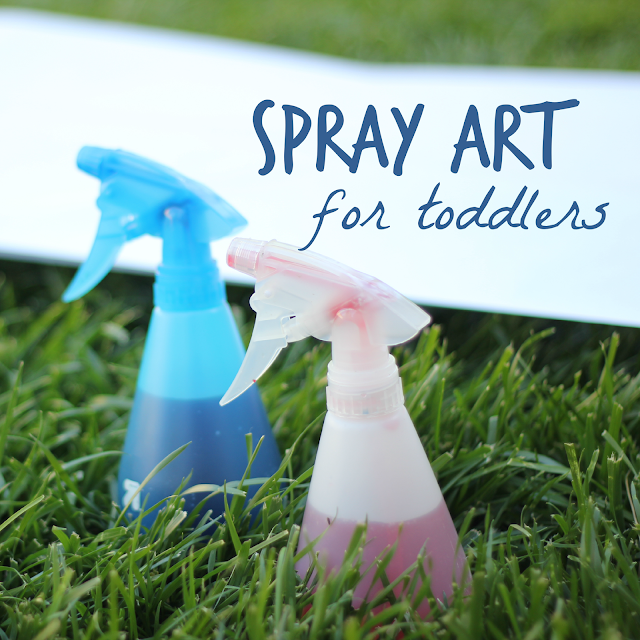 Do you have a toddler who loves spray bottles? What other fun ways have you played and created with them? If you have a younger toddler who isn't that great with a spray bottle yet, grab some turkey basters (cheap at the Dollar store) or droppers and do some drip painting onto your big paper instead. Make sure to head over to I Can Teach My Child tomorrow for her first project of our A Very Toddler Summer series. 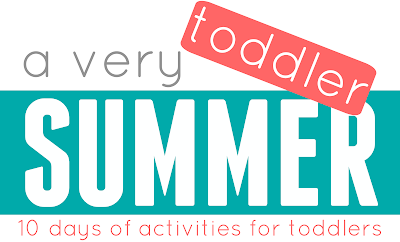 If you want to keep up with our A Very Toddler Summer series, subscribe via email (in the right column of the blog) or jump over and follow Toddler Approved on Facebook and you'll see our A Very Toddler Summer posts each morning. PS- If you like these ideas, come check out my e-books. 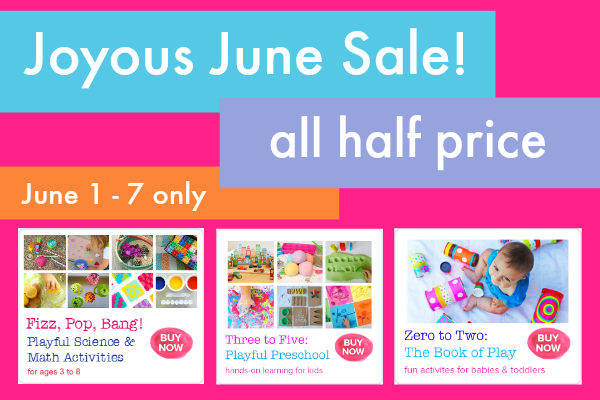 All of my e-books for toddlers and preschoolers are HALF-OFF this week!! Go HERE for more details. Great idea as my 4 year old granddaughter loves my spray bottle and my 18 mnth old grandson started with it but only knows how to spray himself. Guess Im going shopping for paint and more spray bottles. Thanks!